I am headed up to Maryland this afternoon, for eight days of resting down and back into a vast mandala of healing wisdom. There is an annual retreat held at the Tibetan Meditation Center. 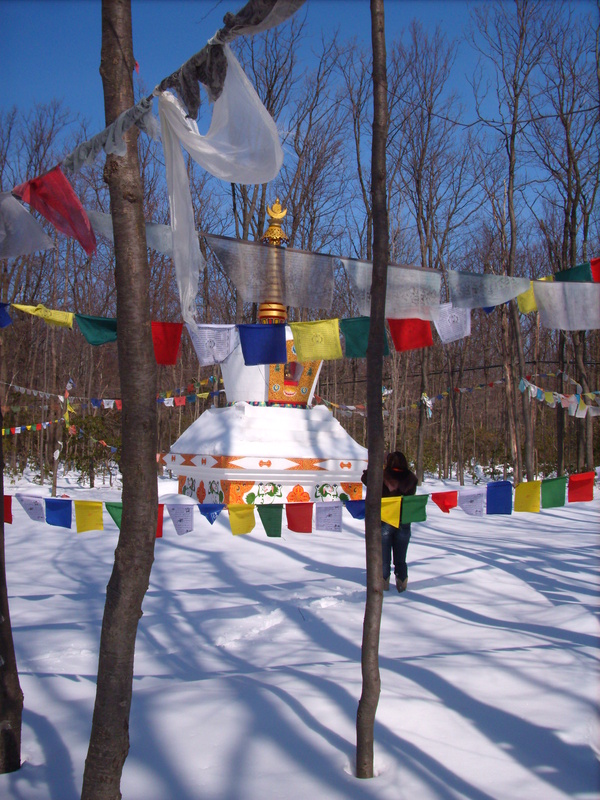 This year, the focus will be on the practice of Chenrezig (Avalokitesvara) and the mantra Om Mani Padme Hung Hrih. In the mornings, Khenpo Tsultrim Tenzin will teach on many of the levels and layers of this expansive, compassion-engendering practice, then in the cold wintery afternoons and evenings, we will warm up our hearts by reciting the mantra for the benefit of all sentient beings. Yay! Some people are calling this a ManiDrupchen but I think that is erroneous as we are not chanting around the clock and there is not a sand mandala being created (see my previous posts). I would call this the annual TMC Winter Retreat whose focus is on the Mani mantra. Khenpo Tsultrim, Khenpo Chophel, Lama Gyaltsen and Drupon Thinley Ningpo will be leading us and I am particularly looking forward to Saturday and Sunday in the New Year (the first and second). Then we will chant the Mani mantra all through the night. Yummy. When I return, I plan to finish some threads I started previously. I am no longer working (for someone else) so I will have more leisure time and energy – I am still seeing clients for bodywork and spiritual astrology (and I need more clients of course). Well, many blessings to you and if you want, you could chant the Mani mantra with us this week. We will be chanting from 2 to 5 pm (EST) and 7 to 9 pm through the week, then from 7 pm to 7 am on Saturday night. Hope you can join us! Glad to hear of your change. I know you can do it; and I think, once you finish what needs to be done, your travels will be much yummier and more fulfilling. Enjoy the Drupchen, I think you are one the right path.